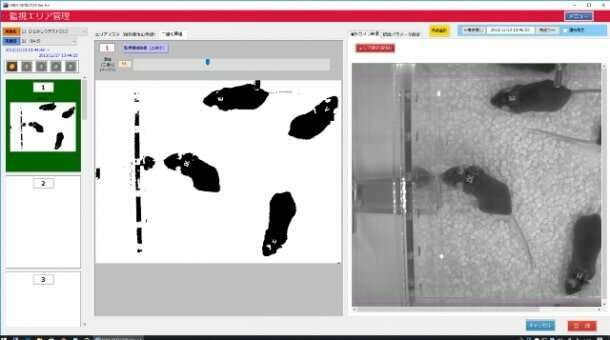 To investigate, a research team led by Professor Masaki Kakeyama of Waseda University developed a novel video-based behavioral analysis system for a long-term behavioral tracking of multiple mice. This software, referred to as the multiple-animal positioning system (MAPS), can automatically and separately analyze the social behavior of multiple mice in group housing. In their study, Professor Kakeyama's team examined how social experiences of mice in adolescence affects adult social proximity with unfamiliar mice. First, male mice were either housed in groups or reared in social isolation during adolescence. To detect behavioral differences of mice when interacting with other adult mice from the same rearing background, four mice that had never been co-housed before were placed in an experimental chamber, creating a group-housed-mice-only housing and socially-isolated-mice-only housing conditions. Their behavior was then recorded by MAPS. "Though both groups of mice began to explore the experimental chamber almost immediately, the group-housed mice began to huddle in one location within two hours. On the contrary, the mice reared in social isolation stayed as far away from each other as possible, and it took two days for all four of them to finally huddle together, showing that adolescent social isolation results in deficient social relationship formation in adulthood." In the next experiment, two isolated and two group-housed mice were placed in the same experimental chamber to examine their behavior under mixed housing conditions. The group-housed pair type was the fastest to huddle together, the isolated pair type was the slowest, and the heterogeneous pairs were somewhere in between. Interestingly, the isolated mice took less time to form relationships with unfamiliar mice under the mixed-housing than in the isolated-mice-only housing condition, indicating that it is not only individual behavioral traits but also those of surrounding individuals that can influence social proximity. The results of this study may not be directly applicable to humans, but Professor Kakeyama hopes that the newly developed software will contribute to understanding of development through socialization and the treatment of psychiatric disorders such as autism spectrum disorder and social anxiety disorder.